This post continues the series of navigation related exercises which were requested by navigation course and nautical college teachers. When the post expires, its contents will be included under the menu heading ‘Navigation Exercises’ on the home page. Position: 34o 28’.45S. 172o 25’.8W. Click here for answers to test questions. 4 Responses to Exercise 4 – Local Hour Angle. Thank you for your interest. To answer your question, yes, Mars is one of the so called navigation planets and as such its GHA is listed in the Nautical Almanac for any hour of the day. 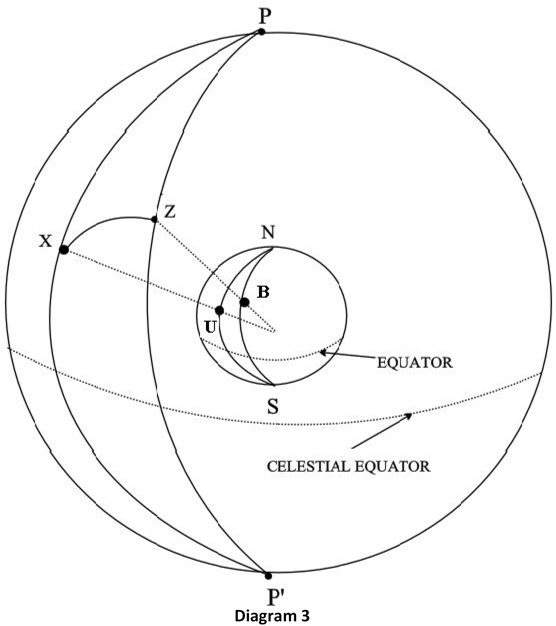 Since the LHA is simply the angle between the meridian of an observer on the Earth’s surface and the meridian of the geographical position on the Earth’s surface of a celestial body, the rules, as explained in my book, will work for Mars just as they will for any other celestial body. Sorry, it has just dawned on me what your question is really about. Since the document to which you refer concerns time systems for Mars, I presume that you are asking if the system for LHA that is used on Earth could be applied to Mars. I can see no reason why not but it would require a system of longitude to be devised for that planet and it would also require calculations of the equivalent of the GHA of other celestial bodies as they would relate to Mars and for all of this data be collated into a collection of tables such as the nautical almanac.